And so I thought that, for me, metaphorically sharpening the axe would involve meditating. It’s something I have dropped in and out of over the past few years and I’ve found is only really achievable when in a steady routine. Now that I’m staying in the same place for three weeks, I’m hoping that this structure will facilitate the ability to sit down in silence for 10 minutes every morning. A couple of years ago, I wrote about my thoughts of giving meditation a try and the benefits I felt. 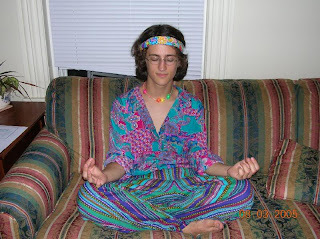 I always thought meditation was for hippies. As kids, my friends and I would initiate a lotus position on the school field, start going “Ommmmmm”, before bursting into giggles and scurrying off to play football. As I got older, the association with meditation became a bald monk in a Tibetan forest, or a ‘new age’ 40 year old woman dressed in white linen. But with the aid of science, technology, and influential bloggers — meditation now seems to be entering the mainstream somewhat. And so I thought I’d see what the fuss is about. Better Focus, Less Anxiety, More Creativity, More Compassion, Better Memory, Less Stress, More Grey Matter. The primary benefit for me is that I really enjoy the ten minutes every day that I do it. There are some practices that you do, where you know that there is a long term trade off with the action that you are undertaking. Brushing my teeth is one that’s stood the test of time. I don’t relish the activity of wiggling a bit of plastic in my mouth every day, but I know it’ll keeps my gnashers in good order for years to come. I thought it would be the same with meditation. Begrudgingly sitting down for 10 minutes each morning, with the hope that my focus/ anxiety/ creativity etc. would indirectly benefit. However, both things have happened. I always look forward to it. And make to time in my day to accommodate. In a world with a bombardment of noise, information, and flashing notification lights having this quiet time is bitesize bliss. And what’s more, I’ve begun to feel some of the heralded benefits of meditating beginning to permeate into my daily life. If the thought of someone assuming that by meditating you are one of those incense-burning, baggy trousered, free spirits (no offence) — then there’s no need to worry. I’ve found meditation to be an almost exclusively private activity. And so all you need is to try it out for a few days, and if you don’t like it, no-one need ever know about your brief flirtation with attempted mindfulness. I felt some benefits right away, but it took me a couple of weeks before I started feeling I was getting more out of it. For me, having read up on how others had found it enjoyable/ beneficial, it was something that I was willing to persevere with. Though I am certainly far from an expert (in fact, probably still far from intermediate) it’s something that I can see myself sticking with. Another vogue (though perhaps age old..) concept is how to be more productive. Articles about remaining focused, removing distractions, and spending your time on what matters are continually filling up my Pocket. This blog post by Scott Hanselman is one of the best at summarising the thoughts behind stripping out the fluff, and staying focused. These two areas of interest seem to me to be inextricably linked. If the essence of being productive is to be considered with your actions, then something like meditation undoubtedly helps.